It’s SAFE to play on! 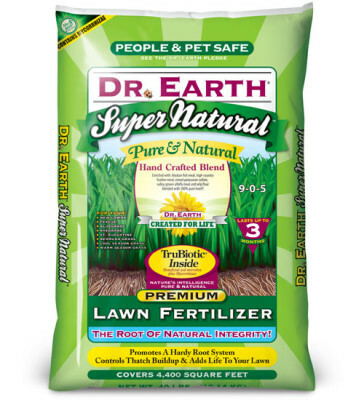 Dr. Earth Lawn Fertilizer (9-0-5) promotes a hardy root system and controls thatch buildup. Best of all, it contains mycorrhizae, beneficial fungi that enhance your lawn’s ability to absorb nutrients and water, to ensure that nutrients are made available to the grass roots, even under high stress conditions. Super Natural contains a 100% NATURAL, hand-crafted blend of fish meal, fish bone meal, feather meal, potassium sulfate, alfalfa meal, calcium sulphate, seaweed extract, mycorrhizae and beneficial soil microbes. Each 40 lb bag covers 4,400 square feet and last up to 3 months after application. • 100% Natural & Organic — SAFE for people and pets! – First, it stimulates roots to grow deep into the soil to absorb nutrients. – Second, mycorrhizae expand the root system — more nutrients can be absorbed. 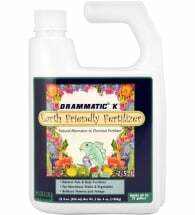 • Slow release formula — feeds your lawn and your soil for up to 3 months! 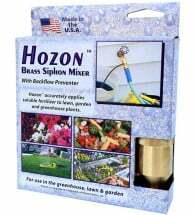 • Promotes healthy lawns — NO growth spikes! Available in 40 lb sizes. Easy to use, just follow the seasons! Early Spring (February – April): During this crucial period, feed your lawn just after the first signs of growth. 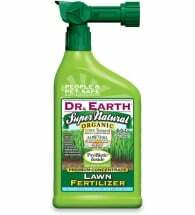 Apply 20 lbs per 1,000 square feet of lawn area (approx. 50′ x 20′). Your lawn will love it! Late Spring (April – June): At this transitional period, your lawn will benefit from a light feeding to remain vigorous and green. Apply 20 lbs per 2,000 square feet of lawn area (approx. 50′ x 40′). Summer (June – August): Another feeding will benefit the lawn greatly, to keep it lush and green, especially if it is new or tired. Apply 20 lbs per 2,000 square feet of lawn area (approx. 50′ x 40′). Fall (August – November): This is a very important time to feed, to allow it to winter over. 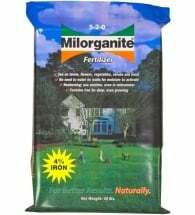 Apply 20 lbs per 1,000 square feet of lawn area (approx. 50′ x 20′). You will see a big difference in your lawn next year. In addition to a productive soil, all lawns can benefit from periodic aeration (prior to feeding) and the addition of a good organic compost or planting mix.